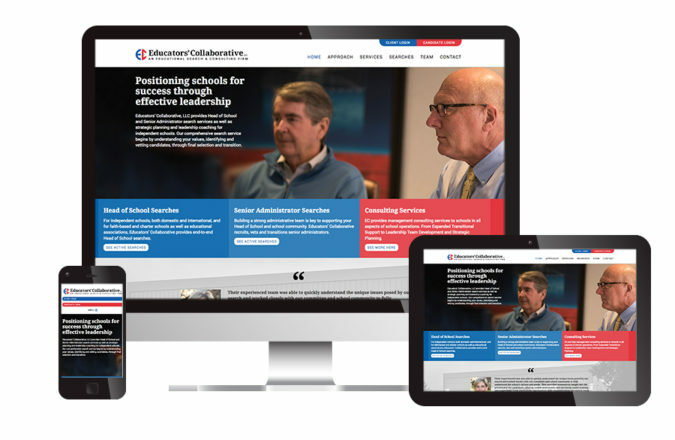 We recently completed a redesign of the website for Educators’ Collaborative. 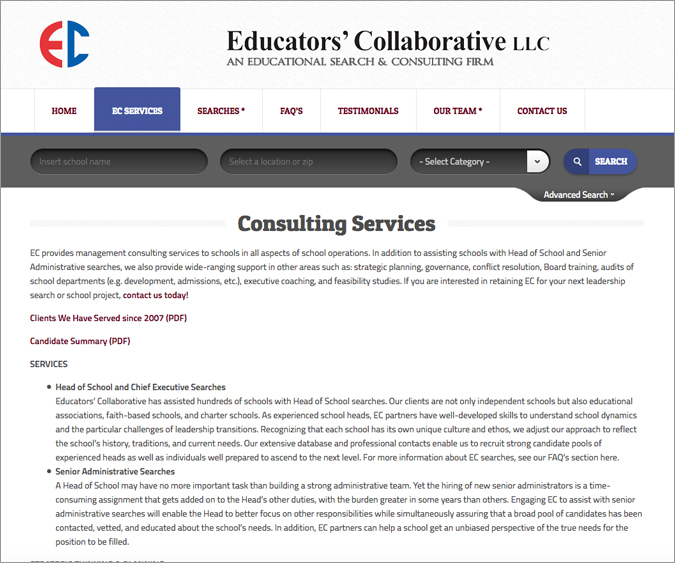 Educators’ Collaborative (EC) is a firm that specializes in searches for heads of schools and senior administrators as well as providing consulting services on all aspects of school operations. While their business is very referral-based, their web site had to validate the professionalism of their firm’s work. Additionally, they wanted to use the search listings portion of their web site to attract candidates, compile the candidate’s files, and also work as a portal for client communications. 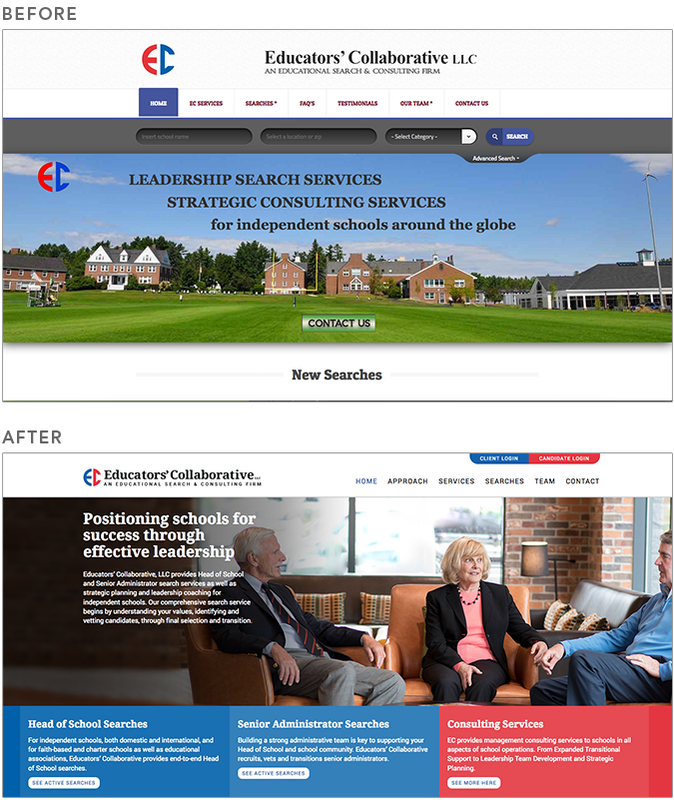 Their old site felt dated, was hard to navigate, and didn’t show potential clients the expert and personalized attention they would receive from the EC team. During the initial discovery phase, Visible Logic helped EC clarify how they wanted to represent their brand, how their personalized approach could be made more apparent through the web design, and how their search listings should function. 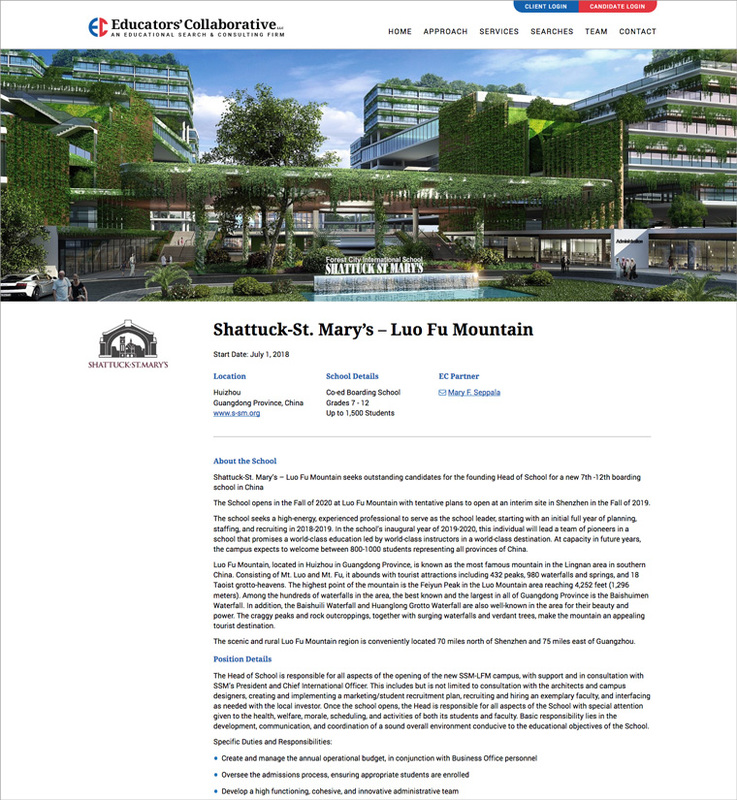 A sample of a text-heavy interior page from the old site. 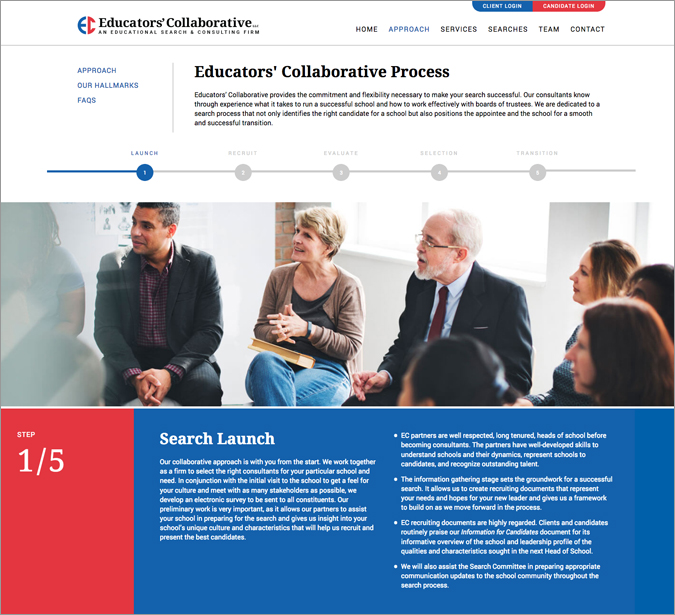 The site features a graphically-rich section that shows what it’s like to engage Educators’ Collaborative. The 5-step approach outlines who they work with clients. The updated listings page focused on the right details, making it easy for candidates to see new job listings. The individual listings were not much more engaging. They showcase the important details in a consistent way from one listing the next and across all browser sizes. A customized back end means that the client can create new pages and make updates quickly and error-free. 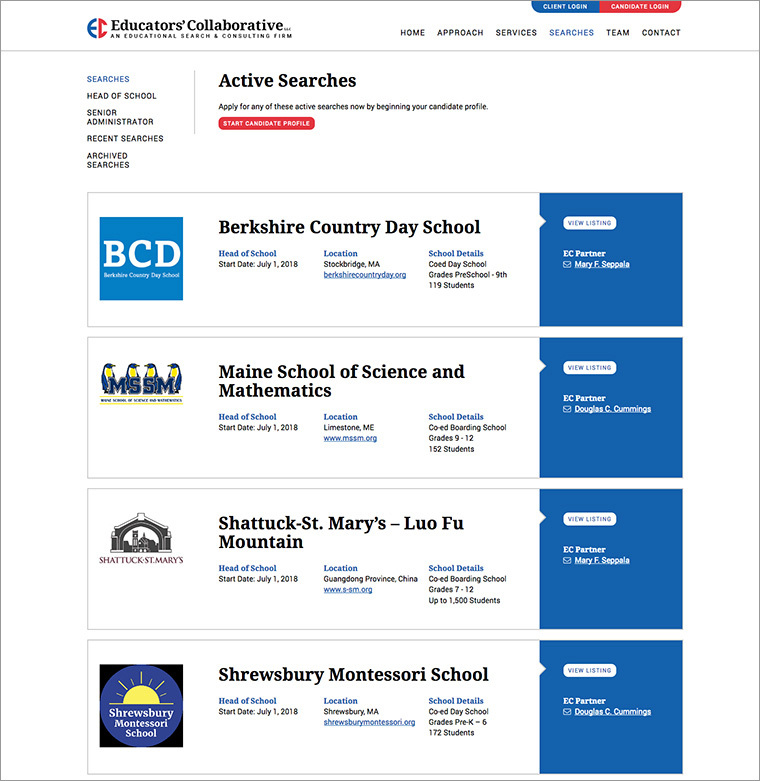 The new site is now a much better representation of the Educators’ Collaborative brand image. By using more photography, by editing content for length and clarity, and by creating a more professional overall design, the web site reflects the quality of the EC experience. In addition, we built out a client and candidate portals. Now the EC team can share files and documents with their clients and job candidates can upload and download materials such as resumes and reference letters. The new site is now working much more effectively as a marketing tool for the client, as a jobs listings site for open searches and a web-based portal for file sharing between EC and their clients and job candidates.